The Norbert F. Beckey Bridge carries drivers from Muscatine, Iowa to Rock Island County, Illinois at the east end of Iowa 92. The 1972-opened steel girder bridge includes a truss section across the Mississippi River channel. Photo taken December 31, 2006. Iowa 92 crosses the width of the state between Council Bluffs and Muscatine along a 279 mile course. The state highway transitions to Illinois 92 east to the Quad Cities and Nebraska 92 west into south Omaha as part of a 886-mile route from Torrington, Wyoming to LaMoille, Illinois. Iowa 92 mirrors the trek of I-80 one county to the south, joining the seats of Greenfield, Winterest, Indianaola, Knoxville, Oskaloosa, Sigourney, Washington and Muscatine. County Road G36 (220th Street) continues the east-west alignment of Iowa 92 to the north of Washington. Iowa 92 joins Iowa 1 south to the city. Photo taken 12/31/14. An end shield precedes the Washington County G36 intersection with Iowa 1 and 92. Photo taken 12/31/14. County Road G36 west becomes Iowa 92 leading west from the Washington area to West Chester. Iowa 1 splits with Iowa 92 for a northerly trek to Kalona. Photo taken 12/31/14. Washington County G37 spurs east from Iowa 1 & 92 along 18th Street to North Marion Avenue in Washington. Iowa 92 loops south to the business district. Photo taken 12/31/14. A trailblazer references the Red Ball Route along Old Military Road north after Iowa 92 and Railroad Street in the city of Ainsworth. The Red Ball Route preceded the Avenue of the Saints corridor between St. Louis and the Twin Cities in Minnesota. It was laid out in 1913 and promoted by Robert N. Carson, an American Automobile Association member and native of Iowa City. The route required a width of 26 feet wide with a grade no higher than 4 percent. The surface was comprised of 12 inches of macadam and two inches of finely crushed stone. The Red Ball Route was designated as Iowa Primary Road Number 40 and by 1925 as part of U.S. 218. It was fully paved from Iowa City to Cedar Rapids by 1927.1 Photo taken 12/31/14. A painted route marker on the old Ainsworth Bandstand along Railroad Street in Ainsworth references Iowa Primary Road Number 2. Primary Road 2 was designated in 1920 and decommissioned in 1939. It was replaced by Iowa 92 between Oskaloosa and Muscatine. Photo taken 12/31/14. Until 2014, U.S. 61 Business and Iowa 92 overlapped from southwest Muscatine through Downtown. 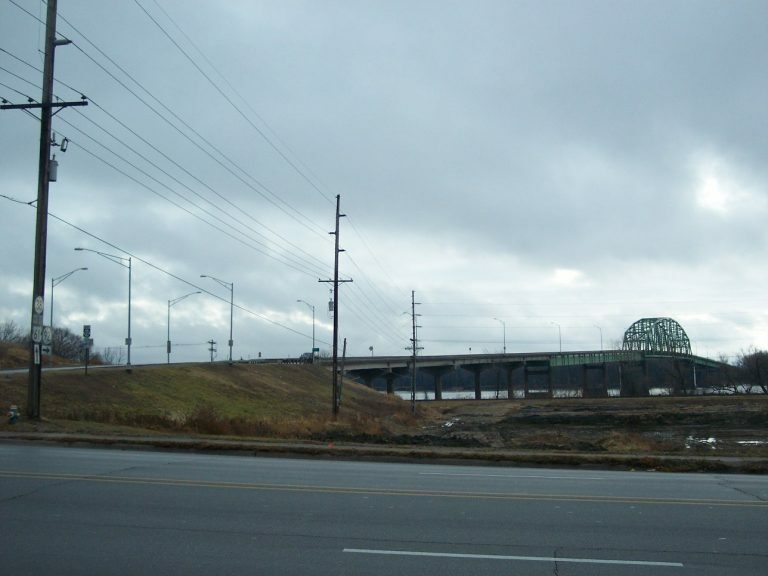 The Beckey Bridge (Iowa 92) across the Mississippi River appears beyond the adjacent Dakota, Minnesota & Eastern (DME) Railroad tracks as U.S. 61 Business (former Iowa 92) turns north onto Mulberry Avenue to connect with 2nd Street from Mississippi Drive. Photo taken 12/31/06. U.S. 61 Business (2nd Street) crosses Mad Creek and intersects the west end of the Beckey Bridge at Iowa 38 and 92. Photo taken 12/31/06. "The Red Ball Route, the original Avenue of the Saints." The Gazette (Cedar Rapids), May 18, 2014. 12/31/06 by AARoads. 12/31/14 by AARoads, Bill Gatchel, and Scott Onson.